HOUSTON (KTRK) -- The University of Houston's Student Government Vice President has been sanctioned following a social media controversy. 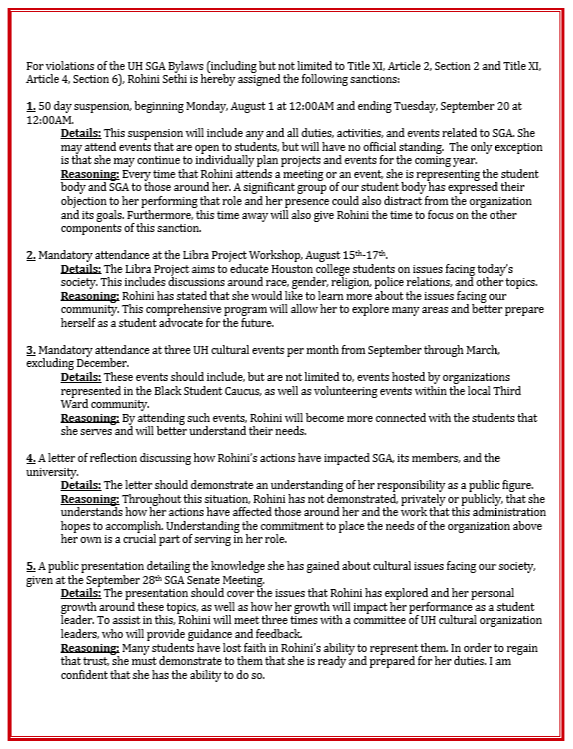 Vice President Rohini Sethi's five sanctions include a 50-day suspension beginning Aug. 1, mandatory attendance of the Libra Project diversity workshop, mandatory attendance of three cultural events per month, a reflection letter and a public presentation in the Senate Meeting on Sep. 28. 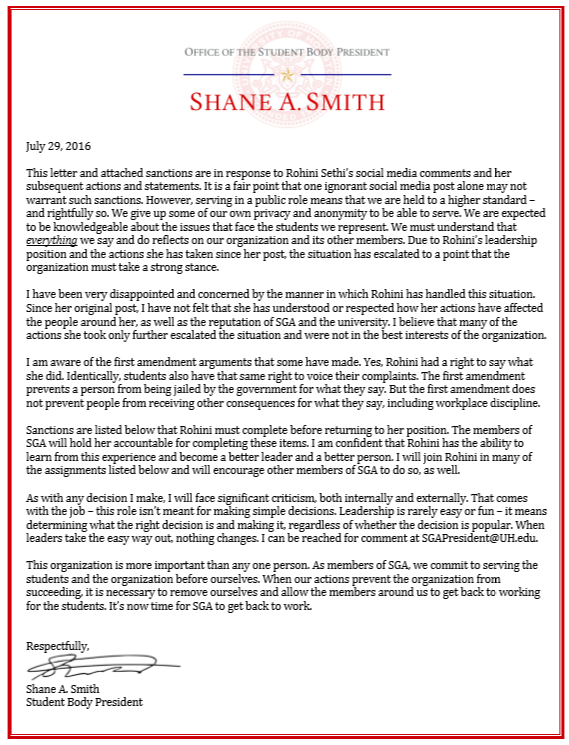 The Student Government President Shane Smith was given a one-time power to determine Sethi's suspension by the Student Senate. It was passed with 13 votes of approval, two against and one abstaining. He released the letter below. Between the Senate Meeting and the sanctions' announcement, five more days of suspension were added. The controversy began after Sethi posted, "Forget #BlackLivesMatter; more like #AllLivesMatter" in a now deleted Facebook status. A Facebook post by a member of UH's SGA about Black Lives Matter has some students calling for her to be removed from her position. Members of the University of Houston's student body called for Sethi's removal, but impeachment proceedings would be a long process. According to the SGA constitution, it would take three-fourths of the senators, or unanimous decision between the president and speaker of the house, a now-vacant position, to nominate her for impeachment. Then, she would stand trial in the Supreme Court.